The inspiration for Chocolate Cravings came from Cathy’s years of making butter creams and peanut butter balls for family and friends for the holidays. As requests for her candy grew, she studied with Ecole Chocolat where she received her certificate as a Professional Chocolatier. Cathy continues to develop new products and refine her skills through classes and travel around the world to meet chocolatiers. In 2009, she opened her own shop in the Lakeside area of Richmond. Cathy continues to participate in regional farmers markets and her products can also be found in local stores. 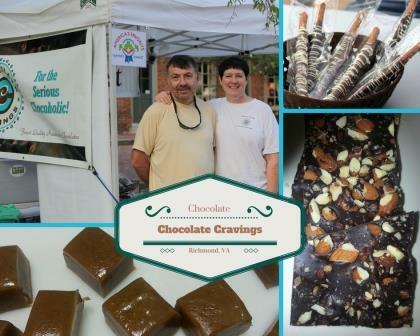 All of Chocolate Cravings’ fresh chocolates are made by hand in Richmond, Virginia with premium Columbian chocolate, and seasonal and local ingredients. Cathy focuses on unique flavors and combinations to satisfy The Serious Chocoholic.